The other side of Maxwell Point is an engaging place, full of rocky labyrinths, caves of varying sizes, and a fascinating array of sea stacks. There was once an arch here, but that crumbled around 2005 or 2006, during a particularly wave-crazy winter, leaving two sea stacks in its wake. Before, it looked a little like the time portal in an old school Star Trek episode. 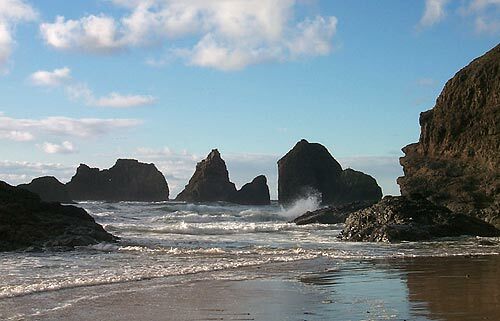 At low tides, the far end of this cove (where the angel walk used to be) allows some access to the sea stacks, and a multitude of starfish colonies become evident. 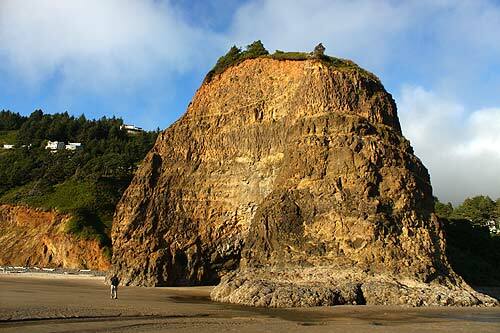 This hidden cove is also known for good agate hunting. Oceanside's secret area, at extreme low tide, back when the arch was still present.